Lavorare in Multitasking: fare due cose contemporaneamente è come farne nessuna? Come sappiamo , il multitasking umano (human multitasking) è l’attività di un individuo di svolgere e gestire più attività contemporaneamente, come telefonare mentre si scrive un’email, mandare un messaggio mentre si guida, eccetera. Si tratta di una pratica estremamente diffusa presso tutti i lavoratori ‘tecnologici’ (direttamente derivata dalle modalità d’uso del computer), abituati a lavorare allo stesso tempo su vari fronti, elaborando in parallelo varie informazioni ed operando contemporaneamente con contenuti cognitivi differenti provenienti da differenti tecnologie. Il vantaggio del multitasking è che consente di essere più rapidi su diversi fronti contemporaneamente, lo svantaggio principali e la minor concentrazione nell’esecuzione dei singoli compiti con una abbassamento della qualità. Mentre per alcuni il multitasking è un segnale di efficienza, sempre più ricerche scientifiche dimostrano che il multitasking può essere dannoso per la concentrazione e condurre ad un netto peggioramento della qualità con cui portiamo a termine i nostri compiti. Sembra infatti che sviluppare la capacità di avere un’attenzione ampia e divisa su più fronti limiti la capacità di affinare l’attenzione di tipo selettivo. Più nello specifico, il multitasking comporta problemi di attenzione e di accuratezza nel caso i compiti facciano capo a funzioni simili, mentre, in caso contrario, svolgere più compiti nello stesso momento può rappresentare un vantaggio. L’argomento Multitasking è decisamente interessante. Continuiamo quindi ad approfondire la conoscenza di questo ‘fenomeno’ pubblicando alcune nuove interessanti ricerche internazionali dedicate a questo tema riportando, per pigrizia di traduzione, un breve abstract in lingua inglese. 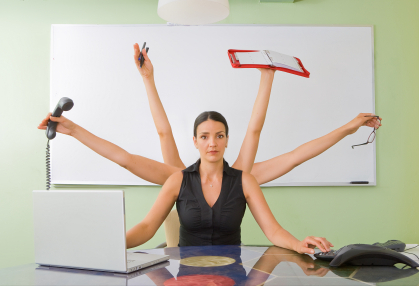 This proposal takes a look at multitasking and its impact on the workplace. As workplace technology evolves, managers need to make decisions in an effort to increase productivity. The review of literature pertaining to the subject indicates that multitasking has been shown to both increase and decrease productivity. This leads to further questions on how multitasking should be implemented. In order to evaluate the impact of multitasking in the workplace, quantitative and qualitative data can allow for analysis of multitasking in terms of impact on the individual and the organization, and give management proper insight to choose the right method to increase efficiency. While the productivity paradox has now been officially pronounced dead, the argument and the evidence for this assertion are both at a macroeconomic level. What has been less closely examined is the microeconomic impact of recent developments in ICT on the productivity of office and knowledge workers. There is an assumption, readily seen in many advertisements for mobile technology, that multi-tasking, WiFi connected laptops, Blackberrys, smart phones and so on are good for business and make people more effective and productive. This may be true some of the time and there is some (albeit limited) research which supports claims that these technologies increase productivity. However there are also emerging concerns that, in certain environments, these technologies may actually reduce productivity in both the short and the long term. This paper examines this problem and research to date and proposes a framework for further investigation of this phenomenon. dia multitasking to the point of “crackBerry” obsession. Aside from the recent alarming reports about the dangers of cell phone use while driving1 or the impact of web surfing on worker productivity, little is known about the larger implications of this now ubiquitous behavior. Merrill Warkentin – College of Business, Mississippi State University, Mississippi State, MS, U.S.A. Instant messaging (IM) technologies are being rapidly deployed in the workplace. Current studies largely focus on the adoption of IM and how IM is used. Little research has been conducted to understand the potential impact of using IM in the workplace. This paper theorizes and empirically tests how the frequency of IM interruptions and the position power of message sender could interact with an individual’s polychronic orientation, that is, multitasking preference, and jointly influence employee satisfaction and subjective task complexity. The present study illustrates that polychronic knowledge workers are more satisfied with the multitasking work process deploying IM technology than monochronic ones. In addition, the effect of interruptions is dependent upon an individual’s polychronic orientation. The increase in interruption frequency only reduces the process satisfaction of monochronic individuals but not polychronic individuals. Further, the polychronic orientation of message receivers also influences how they process information. When IM messages are sent from their supervisors, monochronic individuals tend to prioritize tasks and perceive a lower level of overall task complexity. The information processing of polychronic individuals seem to be less influenced by the position power of message sender. - Computer e mal di schiena. Che fare?